As ever a big welcome to this week’s Preview where we find ourselves in some predicament. Unless you’ve been living in a cave for the past week you’ll of seen that a potential outbreak of Equine Influenza has shut down all racing in Britain until the earliest of next Wednesday. However they are still racing in Ireland having just shut the door on all UK horses. As a consequence this week’s preview will come from Naas instead of Newbury. Enjoy! Debuchet heads the market in what looks a trappy looking contest here, if turning up in form he should go very close however he can flatter to deceive and has been an expensive one to follow. I’d personally be up for siding with SKY MARSHAL here. A decent performer on the level in the UK or Ed Walker and ran a cracker last time out, Davy Russell on board and he could go well again here. Emily Moon and Empire Escape also stand out as chief dangers in this sizeable field. Another difficult looking affair to get your head around here as there’s not much to go off when it comes to some of these. The likely winner for me comes in the form of the market leader All For Joy as he’s been knocking on the door for a good while now with a string of seconds in bumpers. Advantage Point looks the chief danger if the betting is anything to go by, a market check is needed in the Gigginstown duo. In particular FAUGUERNON for Noel Meade, a very interesting runner who won at Listed level in France, a nice return last time and is expected to go better again here and that’s why i’d be willing to chance him in this. A Listed Mares Chase is the most eye catching race on this card a contest that kicks off at 2.10 and is an affair that’s ridden over a distance of two miles. As you’d expect its a race that has a strong presence from the Mullins and Elliott yards. It’s Willie who trains the current market leader in Pravalaguna. She’s a talented mare who opened her account over fences in some style last day when winning by the best part of 8 lengths. 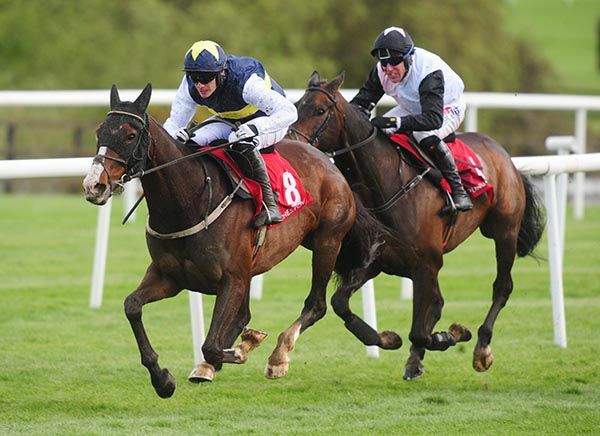 She was also a winner at the Punchestown Festival last year under Paul Townend and that particular partnership is once again renewed here. She sits at the top of the market at a general 4/7. It’s a Gordon Elliott contingency that follow the Mullins hot pot in the market and these come in the form of Synopsis and Mrs Lovett. Both horses trade in or around the 6/1 mark in the betting with Synopsis possibly just edging it, she’s got two wins over fences already to her name but comes here with something slightly to prove at this trip and coming here off the back of a pulled up effort at Huntingdon the last day. Mrs Lovett also got a couple of chase wins under her belt before having a crack at Listed level last time at Warwick. She was underwhelming in that particular affair though and will come here with a few questions to answer herself on the back of that. Teacher’s Pet has six wins to her name and is certainly one of the more experienced players in the line up, she was narrowly denied last time and this drop down to trip looks the right thing for her here, you can find her trading at a general 15/2 mark. This looks somewhat of a prep run for Ross O’Sullivan’s Baie Des Iles as another potential campaign aimed towards the spring Grand Nationals looks on the cards, she’s massively down in trip here and looks up against it over this distance. She does have the services of Ruby Walsh though. 100/1 outsiders Echoes Of Family and Miss Titanic conclude the line up. It’s a shame this race has only attracted the seven runners as it makes it hard to look at it from an each way angle. Putting it bluntly I think Pravalaguna will win this, and should win this. There’s a lot of questions hanging over the rest of them and she comes here with solid form and looking the obvious winner, this is reflected in her short price. If you are one that doesn’t mind betting each way in a seven runner race, the Elliott pair look the obvious two however there’s no real ‘value’ going each way on either of them so one at a slightly larger price that could well prove the each way proposition is Teacher’s Pet. She has a slight experience edge on a few of these which could well be a factor at the business end of things. Two mile hurdles seem to be the order of the day here and Joseph O’Brien looks to have a firm grasp upon this one having the two market leaders. His first string looks to be Konitho in the JP McManus silks, he won a big field maiden last time and certainly looks the one to beat here. I’m going to chance Joseph’s other runner though BAND OF OUTLAWS. He also won last time and is generally a very consistent sort, a solid performer on the level too previously, and at a slightly bigger price than his stablemate he could well give him something to think about. Maze Runner and Coko Beach look the pick of the rest. An extremely competitive handicap chase concludes my punting for the afternoon at Naas and this is a typical race of which you could make a case for most of the field. The one i’ve sided with though is SCOIR MEAR, he’s ran well in a lot tougher contests than this and despite not winning for some time if bringing the same level of form he’s turned up in whilst in hotter races he’s likely in with a big shout. Peculiar Genius is a consistent sort and is one that is more likely to go better than some.